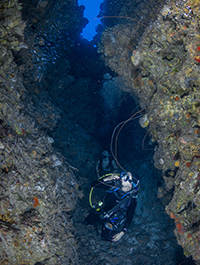 The PADI Advanced Open Water Diver course offered by Cayman Turtle Divers is a great way for certified divers to gain valuable experience and new skills in a supervised manner. And no, you don’t have to be “advanced” to take it – the course is designed so you can go straight into it after the PADI Open Water Diver course. As an Advanced Open Water Diver student you will take part in five dives, two compulsory (navigation and deep) and the other three decided between you and your instructor. This is a great way to get more dives under your belt while continuing to learn under the supervision of your PADI Instructor. This course builds on what you’ve learned and develops new capabilities by introducing you to new activities and new ways to have fun scuba diving. These five dives are accompanied by theory sessions (available online) that will give you the confidence and ability to dive in similar conditions. Gaining this certification also qualifies you to dive up to 100ft/30m. Increase your confidence and build your scuba skills so you can become more comfortable in the water. Book your PADI Advanced Open Water Diver course with the experienced instructors at Cayman Turtle Divers today! You can complete the classroom portion of the PADI course online in your own time before you arrive. Register for the eLearning theory courses with PADI now.